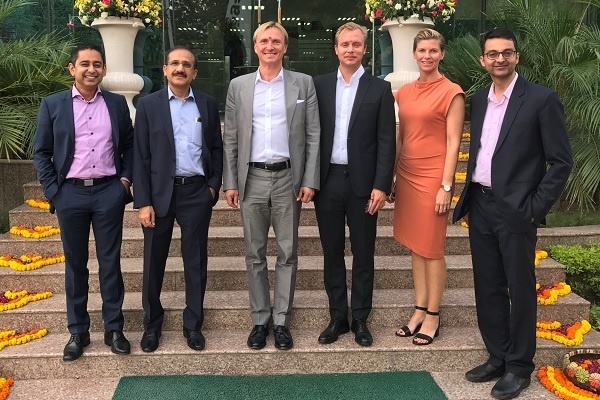 Gurgaon, 23 August 2017: NetEnt CEO, Per Eriksson visited Nagarro India for the first time recently. Åsa Bredin, Chief Development Officer and Pontus Johnsson, Head of Talent Acquisition from NetEnt also accompanied him on this two-day visit on August 21-22, 2017. NetEnt is a leading developer of casino games and platform solutions for online casino operators. Nagarro has been in partnership with NetEnt for almost a decade, positioning itself as an innovation partner, offering solutions such as RGS development, multi-jurisdiction compliance, game compatiblility on desktop and mobile using HTML5, environment management, integration testing and operations support. The visit started with a welcome session hosted by Nagarro CEO, Manas Fuloria where he gave an insight into Nagarro's technology expertise and complex problem-solving skills. "What we are looking to do as a company ourselves is to come up with innovations, ideas, technologies, approaches, ways of working, that really add value to our clients. Part of that is to consider yourself a part of the client’s business. And that I think is where the real potential lies." Speaking about the partnership, Manas added "NetEnt has really taken a deep partnership approach to the work with Nagarro and we just hope to deepen it in the coming years and make it truly symbiotic." An all-hands meeting was conducted after the introductory session where Per presented NetEnt's growth plans and future goals. During the visit, multiple business meetings and discussions were conducted with Nagarro stakeholders and senior management. The offshore team presented their innovation ideas to Per, who was impressed with the team's enthusiasm and invited them to join and present their ideas in the recurring NetEnt innovation events. In addition, a session with Anibrain, Nagarro’s creative design partner for high-end animation, was also held to showcase their portfolio and expertise. NetEnt – a leader in gaming infrastructure for casino operators. NetEnt was founded in 1996 and is today a market leader in gaming platforms for casino games. NetEnt has approximately 900 employees and offices in Stockholm, Gothenburg, Krakow, Kiev, Gibraltar, New Jersey and Malta. Its turnover last year was in the region of SEK 1.1 billion. Growth is currently at about 30 per cent and the operating margin also around 30 per cent. Since 2009 the company has been listed on Nasdaq OMX. Today, we are more than 4000 experts across 15 countries. Together we form Nagarro, the global services division of Munich-based Allgeier SE.